This article aims to tackle camping toilet reviews to determine the top 7 options regarding the best portable camping toilets for you to choose from. However, before we start discussing the products themselves, let us have a look at how you can select the most suitable camping toilet in the buying guide section below. Having a camping toilet with you while you are exploring the wilderness is going to make your experience all the more convenient and ensure that you are answering the nature’s call in hygienic conditions. Chair type. This type of toilet is made like a chair with a hole in the sitting portion, in which a waste bag is attached to collect the dump. The waste bag can be sealed to prevent odor from spreading and thrown after usage. This type is quite easy to use, manage and store, making it a great choice for many people. Flushability. 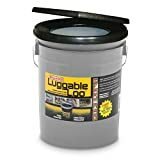 The flushable toilet for camping has a complicated setup integrated to control the water tank and allow you to get yourself and the toilet clean using special toilet chemicals and quick breaking toilet paper. This is a great choice if you are using an RV vehicle on your camping trip. Composting. If you are especially concerned about the environment, this type of toilet may be perfect for you. It works by storing and degrading the dump through dehydration, without letting out odor, allowing you to throw the waste on the soil without being worried about chemical leaching. These are all the different types of toilets which you can use while camping. Your selection should depend on your need for convenient, storage and, of course, your budget. However, do remember that whichever toilet you are planning to use, you must make sure that you are dumping the waste in a proper area. Many camping sites have dedicated waste disposal sites and if your camping region has one, you must prioritize dumping the waste on that site. This 5.3-gallon toilet is specifically designed for outdoor recreational activities, including camping and boating. Additionally, its purpose extends as an emergency option during long car trips. The Camco camping porta potty is made of sturdy polyethylene, making it compact and lightweight at 11.5 pounds (when empty). Despite its lightness, it can handle a weight capacity of up to 330 pounds. On the top half flash tank, a toilet with a lid, seat, and bowl are present and can hold 2.5 gallons of water. On the side, a bellows-type pump works on waste removal. The sides secure the toilet to the waste tank through its latches. On the bottom half waste tank, a sliding gate valve creates an odor and water-tight seal for the waste. The features and functionality that this camping toilet offer makes it one of the best portable potties today. This self-contained toilet features a minimalistic design while still promoting functionality. The Hassock is very lightweight at 5 pounds, scoring big on portability and making it a portable toilet for camping. It also comes with a contoured seat for additional comfort. A toilet paper holder is included in this unit for more convenience. The toilet has a removable inner bucket for waste removal. In addition, Reliance’s Double Doodie bag is compatible with the unit. This Stansport toilet model is the porta potty for camping and other outdoor activities. With the white plastic molded seat, together with its steel legs, durability and stability are guaranteed. The toilet is foldable for ease of storage and portability. This unit comes with six plastic bags. The company covers a one year warranty against manufacturer defects. This portable camping toilet features lightness with it weighing 3 pounds. It can hold 20 liters or 5 gallons of water. This camp toilet uses a bucket style design with a snap-on lid. It’s specifically designed to be durable enough for outdoor and emergency usage. This camping porta potty has a snap-on toilet seat that can hold up to 5 gallons of water. This toilet is specifically designed to be used when in outdoors and in emergencies like when you’re on a long car ride, so to speak for its unit’s name. The snap-on feature secures the seat on the pail. It’s very lightweight as it only weighs 1.10 pounds, making it very accessible for easy storage and portability. The company provides a 5-year warranty against manufacturer’s defects. This model of Reliance’s portable toilet is a collapsible camping toilet that folds down to 5 inches. It provides ease of portability as it only weighs 4.5 pounds, plus it has an integrated handle to make carrying the toilet easier. 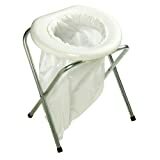 Stability is also featured in this portable potty with its leg locking system, making it really sturdy and safe to use. Its rugged characteristics and high weight capacity qualify this toilet as one of the best portable camping toilets available in the market. The company provides a 5-year warranty against manufacturer’s defects. True to the unit’s title, the Palm Springs portable toilet is designed for outdoor use, mostly for camping or boating. This is a self-contained camping potty that has freshwater and waste-water holding tanks that can handle 3 gallons and 5 gallons of water, respectively. These tanks are constructed from durable polyethylene with a leak resistant design and can be completely emptied, bringing convenience to the unit. The tanks are also secured by corrosion resistant latches from the side. The toilet comes with a comfortable full-size seat with a lid, having a matte finish for scratches. The whole unit weighs 9.75 pounds and has a built-in handle for easy transport. Now we have reached the end of our article. Hope that you found this comprehensive review of some of the best camping toilets helpful. With the product buying guide, you can easily shortlist which type of toilet you prefer and then check out our list for that type of toilet, ensuring that you can quickly make a solid decision, without wasting any time on researching or comparing various products.